Simon Says Stamp recently sent me a few of their exclusive Kelly Purkey stamp sets to try out. I received two graphic sets with lots of fun embellishments and phrases and an alpha set with a perfectly simple font. These sets are perfect for Christmas or Winter layouts. Plus the alpha set would look great on any project! I made a layout with some favorite photos from Christmas 2010 and used the Joy and Plain Jane stamp sets. The papers I used are some of my favorites from the Studio Calico Wonderland collection. 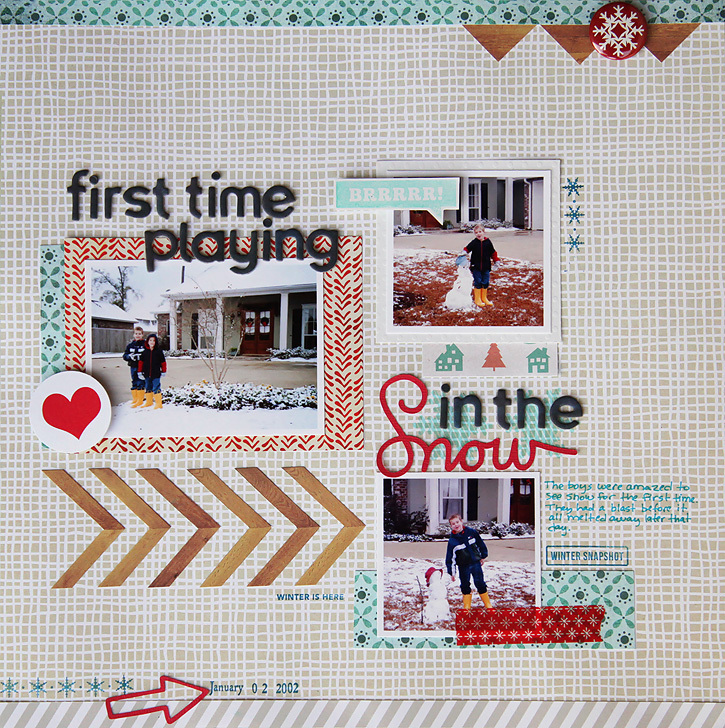 Next I made a layout with the Let it Snow stamp set. We don't get snow very often in south Louisiana, but I had fun scrapping some photos of the boys playing in the tiny amount of snow we got in 2002 - their first time to ever see snow when they were four and six. It was gone by the afternoon, but they had a blast while it lasted! I mostly used my Studio Calico Sock Hop kit to make this layout. I've been having a ball doing lots of Christmas scrapping including December Daily. I'll have more to share soon! These layouts are great! I especially love the colors in the snow one. The red, aqua and gray look great together! I also LOVE that alphabet/number stamp set. I have one that's just lowercase letters but I really want something that has both uppercase and numbers. That one looks great! Loving the color combinations in both layouts and also the multi-colored stamped letters in the first layout. Those are nice layouts. Glad your boys got some snow even though it didn't last long. It's such fun stuff. Those are lovely pages. I so like how the red thickers just "pop" the title off the page. Great layouts! Definitely agree with loving the color combo of both layouts! Very great layouts! Love them! Love these layouts! You are my hero for using stamps on layouts, Deb! Those Kelly Purkey stamps are awesome. Fabulous layouts. Love them both. I try to use stamps as often as I can. Adding the washi tape is a wonderful dimension. 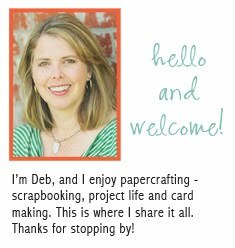 Love your layouts, Deb! And love how you used KP's stamps!